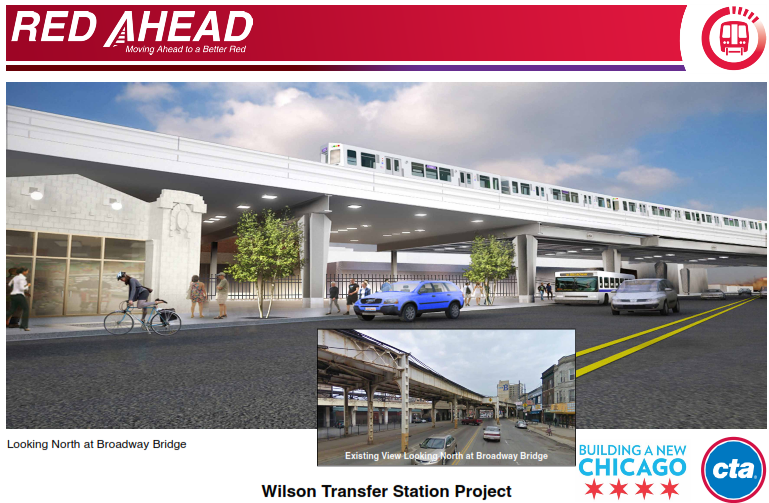 More signs that a brand new Wilson L station, with improved tracks and amenities, is coming. If you were around Wilson and Broadway today, you probably heard and felt the commotion. A four-month project to demolish part of the aged concrete track that runs between Sunnyside and Leland has begun. It's going to continue through July and work will be going on from 7am until 5pm most days, including weekends. It's not going to be the quietest four months, but we've survived longer construction projects, and it will be amazing to see Broadway start to lighten up as the heavy support pillars and overpasses are removed. 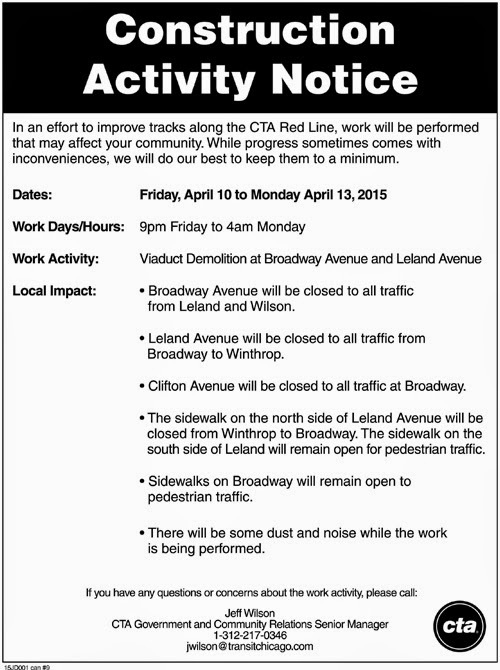 On a similar note, Broadway between Wilson and Leland will be closed to vehicular traffic between Friday night, April 10th and Monday morning, April 13th, so they can begin tearing down the viaduct at Leland and Broadway. If you're driving, it will be a bit dicey to get around Saturday and Sunday. The sidewalks will remain open to pedestrian traffic. 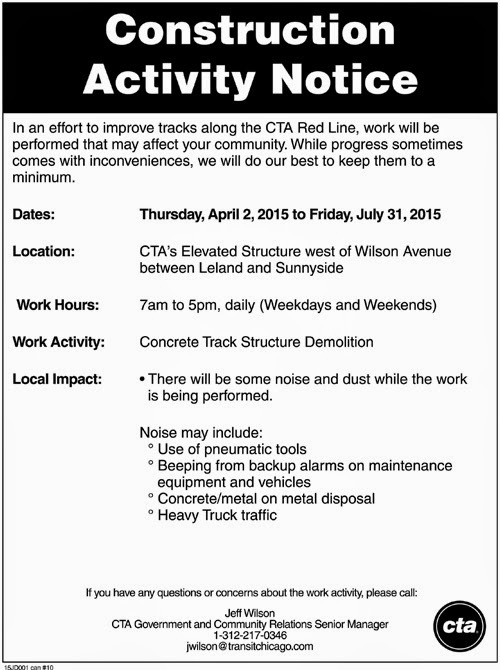 You can see both notices from the CTA below. We urge you to continue to patronize the businesses on the 4600 block of Broadway during the closures. 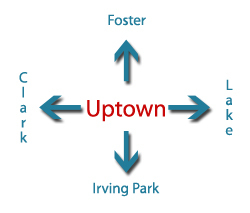 Most are locally owned and depend on your business. There will be more closures as work continues, but keep your eye on the prize: a new station with faster travel times and handicap-accessibility awaits. 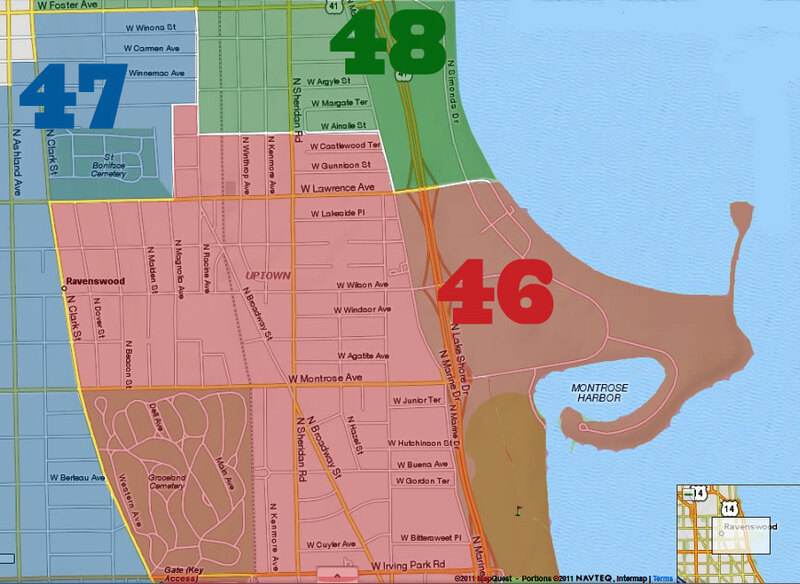 Here's what the CTA says it will look like and the amenities it will include. Thank you, UU, for reminding people to keep visiting and buying from the businesses and restaurants on Broadway during the construction and street closures! They may be a bit more difficult to get to, so they will be depending on their patrons that much more to keep them going. On another note, people who take the 36 Broadway bus during the weekend street closure should make sure they know where the route will be detoured, and expect their trips to be a little longer. I haven't seen anything about the detour yet, but CTA will probably be posting it at the affected bus stops and on their website soon. VERY happy to see construction of the new Wilson station progressing!